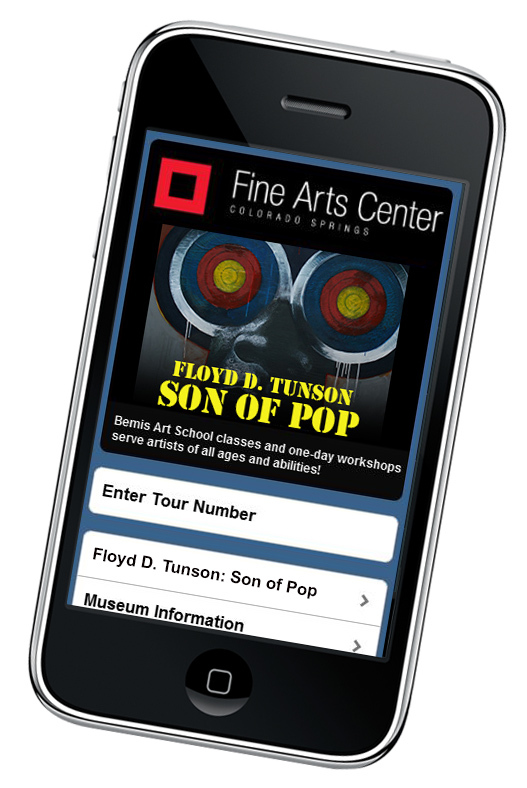 Want to learn more about Floyd D. Tunson: Son of Pop— check out our Smartphone Mobile Tour! Giving you access to exclusive video commentary from our curators, photos, catalog excerpts and more, our Smartphone Mobile Tour helps you engage with the exhibition as you move through our galleries. This bonus information provides rich context for exhibition themes, and is constantly expanding. For example, see the original works by Pablo Picasso and Henri Matisse that inspired Tunson's Remix series, and listen to a musical performance by Othar Turner, one of Tunson's muses. To begin the tour, scan the QR code or type in this url: www.csfineartscenter.org/mobiletour.html. If you see a tour number posted in the galleries, type it in the “Enter Tour Number” key pad. Start digging deeper; all you need is a pair of earbuds and your web-enabled mobile device. Awesome tour! We'd love to have it come over to Pikes Peak Community College (http://pikespeakcommunitycollege.co/) if possible.